Led by experts from the U.S. Census Bureau, this workshop will introduce participants to the use of microdata from the re-engineered 2014 "Survey of Income and Program Participation (SIPP)" and provide hands-on applications to prepare them to conduct their own SIPP-based research project. 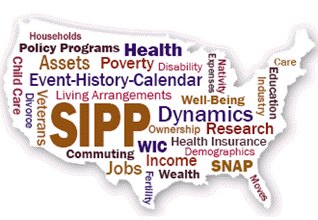 The SIPP is a panel survey containing detailed measures of employment, health insurance, disability, child care, wealth and assets, program participation, and other topics. It is used to estimate the effectiveness of existing federal, state, and local programs; to estimate future costs and coverage for government programs, such as the Supplemental Nutrition Assistance Program (SNAP, formerly food stamps); and to provide improved statistics on the distribution of income and measures of economic well-being in the country. Workshop dates and location: September 18-21, 2017 in Washington, D.C.